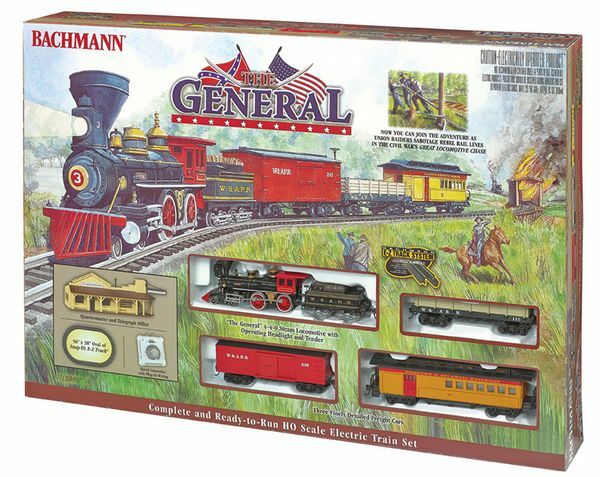 The Civil War’s famous Great Locomotive Chase comes to life with The General train set! On April 12, 1862, James J. Andrew and a group of Union raiders commandeered the South’s American 4-4-0, named The General, from the Western and Atlantic Railroad. Their daring plan was to sabotage rebel railroad lines deep behind enemy lines. An alert W&ARR conductor, William Fuller, noticed the locomotive moving and with two fellow employees was soon in hot pursuit through the mountains of Northern Georgia. They followed The General on foot until they were able to commandeer another locomotive, “The Texas,” to continue the chase. After many stops to uproot track and cut telegraph lines, The General ran out of wood fuel and water and was abandoned. Andrew’s Raiders were later captured outside Chattanooga. Some were able to escape from jail, but eight were hung as spies.